The law on whether NGO ships that ferry thousands of illegal migrants from Libya to Europe via Italy each week are smugglers or rescuers is very murky, but the name of their game is without doubt very fishy. So I asked an independent Dutch research institute, Gefira, which has done lots of work on Europe’s migrant crisis, to take a closer look at the activities of the NGO fleet. In 2016, its 20 or so vessels – together with European Union and Italian naval and coastguard ships – “rescued” a record 181,000 migrants from open boats near the coast of Libya and brought them to Italy, which, at its southernmost point – Sicily, is 275 nautical miles (318 miles) from Tripoli. So far this year, they have “rescued” another 85,000 – 21% up on the same time last year. The 2017 total is expected to be well over 200,000. Most of these migrants are single young men from sub-Saharan Africa (Nigerians as ever top the country-of-origin league table of migrant sea arrivals to Italy) – not a Libyan, let alone a Syrian, among them. All have the equivalent of a couple of years’ wages in their country of origin just to pay to get on a people smuggler boat in Libya (1,000 euros). Few are refugees – unless every African is a refugee. More than two-thirds of Italians (67%) now want Italy to close its ports to rescue vessels or deport all migrants ferried to Italy, and 61% want a naval blockade of the Libyan coast, according to an opinion poll commissioned by the Rome daily Il Messaggero and published on 9th July. The Italians are sick to death of this illegal migrant invasion and of the complicity in it of the four unelected Italian prime ministers since the resignation of the last elected one, Silvio Berlusconi, in 2011. Few illegal migrants are granted asylum in Italy; even fewer deported. The researchers from Gefira, led by Taco Dankers, monitored NGO vessel movements off the Libyan coast over the past few months. They used marine traffic websites – freely available to the public – which track ships in real time via satellite and keep the records in an archive. They discovered that a dozen NGO vessels entered Libya’s territorial waters, often many times. Territorial waters extend 12 nautical miles from a country’s coast. The guilty vessels include Save the Children’s 59-metre Vos Hestia. It was in Libyan waters on the 5th, 16th, 22nd and 23rd of May. They include the even larger 68-metre MV Aquarius, jointly operated by SOS Mediterranée and Medicins Sans Frontiéres (MSF) on the 2nd, 5th, 16th and 23rd May, and as recently as 9th July. They also include the 40-metre Phoenix, owned by MOAS, a Malta-based charity founded by an American businessman and his Italian wife: three times, most recently on 10th July. These four charities receive money directly or indirectly from Open Society Foundation whose founder is the multi-billionaire champion of liberal élite good causes George Soros. Christopher Catrambone, founder of MOAS, donated €365,000 to Hillary Clinton’s 2016 presidential campaign. Not surprisingly, all the holier-than-thou NGOs involved – several are German – consistently deny going into Libyan waters. For starters, to do so without Libyan permission is a violation of sovereign territory. Unauthorized innocent passage is allowed. But how innocent is the passage of the NGOs through Libyan waters? And while rescue inside territorial waters in a life or death emergency is also allowed, search and rescue is not. Ever closer – and hey presto, Bob’s your uncle – well inside. Maritime law obliges ships to assist those “in distress” at sea – i.e. about to die. Is this honestly the case with these migrants? It also obliges the rescuing ship to take those rescued to “a safe place” usually defined as the nearest safe port – i .e. in Tunisia or Malta. So why Italy hundreds of miles to the north? And if the rescue takes place inside territorial waters, the rescuer is obliged to take the migrants back to shore – i-.e to Libya. The Mediterranean is divided in Search and Rescue (SAR) areas extending more than the 12 miles of territorial waters. Every country is responsible for coordinating rescue operation in its allotted SAR area. Due to the state of anarchy in Libya, Italy has taken responsibility for the Lybian SAR area, which has no boundaries with Italy or Italy’s own SAR area. Let us not forget either that EU and Italian naval and coast guard vessels ferry the majority of the migrants from Libya to Italy crossing Malta’s SAR region. 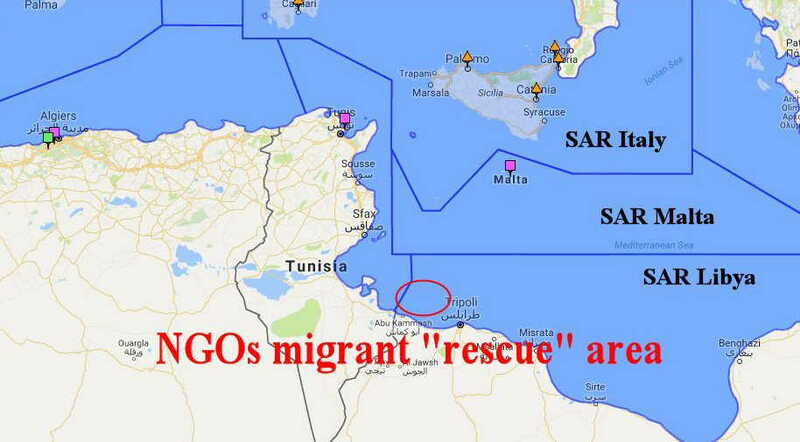 There is no logic in bringing people from the Libyan SAR, crossing the Maltese SAR area, to Italy. The Gefira researchers found an interesting photo of a “rescue” operation in the online archive of Sea-Watch, a German NGO. Needless to say, they also discovered that its vessel, Sea-Watch 2, had been inside Libyan waters several times. The NGOs are usually extremely careful about the photographs they publish but seem to have slipped up here. The photograph shows a large rubber dinghy full of migrants as calm as the sea near a small rubber dinghy with two SeaWatch crew on board, alongside a small fibre-glass boat with no cabin and two men, presumably Libyans, on board. The “Libyans” are handing over a large plastic bag to the Sea-Watch 2 crew who are all smiles. What’s in the bag? Not documents surely, or Heaven forbid, cash? Are these two “Libyans” people smugglers? Exchange between smugglers and NGO. It looks like a transfer rather than a rescue operation. 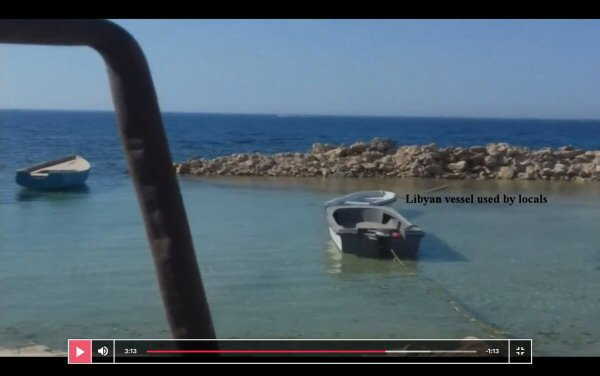 Gefira has found photos of identical open fibre-glass boats moored in Libyan ports on other websites. Collusion between the NGOs and the people smugglers does not even seem to be much of a secret as I discovered, ferreting about on the web in the no-borders world of migrant search and rescue. On a site called The Intercept – whose authors believe that the more migrants in Europe the merrier and evidently have a very close rapport with the NGOs – I read: “Some charities, as well as the Italian Coastguard, regularly receive calls from the Libyan coast, presumably from smugglers, to announce the departure of refugee boats and they base their rescue on that information.” Yet it was precisely to deter migrants setting off from Libya that Italian and EU naval and Italian Coastguard vessels are only allowed to operate 120 miles north of the Libyan coast – except for those involved in the EU’s military operation – Sophia – whose mission to combat people smugglers rather than to rescue migrants has been a surreal failure. A bit different to what either NGO has said until now. Sea-Watch spokeswoman, Sacha Ockenden, declined to comment on the photograph “at such short notice” but insisted that to say Sea-Watch rescues migrants “obviously not in distress” is “entirely incorrect”. According to legal opinion – she explained – “distress” does not require “instant overwhelming physical peril”, merely “the prospect of danger” so just being on a migrant boat is enough. Yes, SeaWatch did enter Libyan waters but “only exceptionally under the mandate of MRCC in Rome”. Ah, those Italians again. MOAS sent me this: “Thank you very much anyway for contacting us. Should you require any further information from our end in the future, please do not hesitate to contact us again.” Clearly, the Italian Coastguard, which coordinates search and rescue in the Central Mediterranean, also has a lot of explaining to do. Despite repeated calls and emails, it declined to comment on the claims by the NGOs that it authorizes them to go into Libyan waters – let alone why it does so. NGO vessels now ferry across about 35% of the total number of migrants brought to Italy. They transfer others, once well north of Libya, to the larger EU and Italian naval and coastguard vessels and return to the front line to pick up more. The Italian government has threatened to stop NGO vessels bringing migrants to Italy unless they sign a code of conduct which, among other things, obliges them to operate only outside Libyan waters. The NGOs refuse to sign. Given NGO claims that they go into Libyan waters only with Italian coastguard authorization, it should also force its own coastguard to sign the code of conduct! Gefira also discovered what I can only describe as a Libya-based migrant travel agency on Facebook which offers “tickets” to “passengers” with “discounts for group bookings” on “ferries” – a.k.a smuggler boats – complete with phone number. The journey only lasts “three or four hours” before the promised rendezvous with an NGO or EU, Italian naval or coastguard vessel. So whatever the intention, the presence especially of all these NGO vessels so near to Libya, is a vital part of the migrant ferry package deal or, if you prefer, of this modern version of the slave trade. That much is crystal clear. The Gefira website is at: https://gefira.org.